My mom and my sister have birthdays this month. August is one of the most popular birthday months of the year and Baskin-Robbins is helping guests celebrate birthdays with its new Too Cute Cupcake cake, perfect for cupcake lovers nationwide! We are offering our readers a chance to win a $31 Baskin-Robbins gift card to get the Too Cute Cupcake. 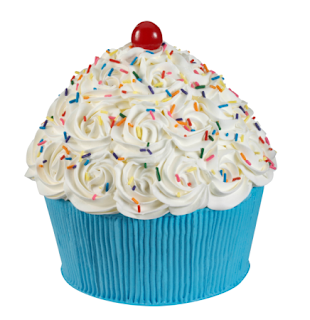 The Too Cute Cupcake is the newest addition to Baskin-Robbins' lineup of ice cream cakes and is an over-sized cupcake filled with a customizable combination of ice cream and cake flavors. BTW, you can find Baskin Robbins on Facebook (https://www.facebook.com/baskinrobbinsUS) and Twitter (https://twitter.com/BaskinRobbins).